Last week was science week in our school and Room 7 were lucky enough to participate in lots of exciting experiments with Dr. David Fitzpatrick. 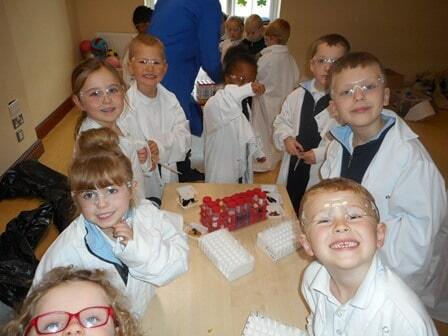 First, we put on lab coats and goggles. We felt like real scientists! Our first investigation involved testing food for starch. We discovered that when iodine was added to cornflakes and bread the food turned black. This indicated that starch was present, meaning these foods give us lots of energy. Then we tested different drinks for protein – 7up, orange juice, milk and water. The milk turned purple straight away so we knew it contained loads of protein. This is why we drink milk to make us big and strong. The next day we wrote a procedure telling someone how to test a food for starch. We are getting really good at using procedural language like first, then, and finally. During science week we also got learn lots of things about our body and our senses. We have 5 senses – do you think you can name them?